Hyundai Mobis is a fast follower in autonomous-driving technology, the head of Mobis' advanced engineering group says, adding that the company can deploy its advanced safety technology within six months of the leaders. SEOUL -- Until 2011, Hyundai Mobis Co., South Korea's biggest supplier, didn't have an autonomous-driving technology program. Then it poached a General Motors engineer to form one, and he's been playing catch-up ever since. Shin Kwang-keun, who oversees the research at Mobis' advanced engineering group, says the company is, for now, still a fast follower. But his team aims to help the Hyundai-Kia group make advanced safety systems and autonomous-driving features mainstream by 2020. "We are not that far behind. We think we are behind by about a year or so," Shin told Automotive News. "We might not be the first to produce this kind of stuff," he said, "but as soon as we see it as successful, we can move." Mobis can deploy its advanced safety technology within six months after the leaders, he said. 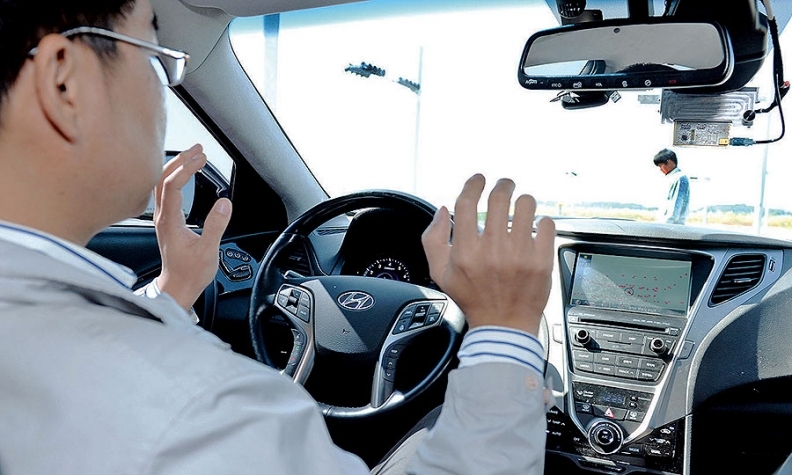 Mobis, the biggest supplier to Hyundai-Kia, plays a key role in keeping the carmaker in the race with advanced driver assist systems, or ADAS, the next-generation braking and steering controls that are a stepping stone to self-driving cars. Shin returned to his homeland of South Korea to spearhead the push in 2011, after more than a decade working in chassis control systems at GM. He joined GM directly out of the University of Michigan, where he earned a doctorate in electronic controls in mechanical engineering. Shin: "Not that far behind"
Mobis ranks No. 6 on the Automotive News list of the top global auto suppliers, with parts sales to automakers of $24.68 billion in fiscal 2013. Kia Motors Corp. holds a 17 percent stake in Mobis, while Mobis owns 21 percent of Hyundai Motor Co. Mobis has hundreds of engineers working on ADAS. Rivals include Germany's Continental AG and Robert Bosch GmbH and Japan's Denso Corp.
Mobis doesn't supply its ADAS systems to carmakers outside the Hyundai-Kia group yet. But within the next year, Shin aims to more than double the headcount at its office in Plymouth, Mich., which has fewer than five people on the project, to do so. Mobis already offers technologies such as lane-keeping assist, adaptive cruise control and smart parking. But it formally set up its autonomous-drive unit only in 2013. Its most advanced parking assist product uses ultrasound sensors to automatically steer the car into a spot. The driver goes hands-free and controls only braking and acceleration. Mobis is developing a next-generation version that will seek out a free parking spot and park itself, with no one in the car. The technology should be ready for market by 2020, Shin said, but there are regulatory hurdles that still stand in the way. "It has more legal issues because nobody is in the car," he said. Mobis is also working on an improved traffic jam assist system that controls braking, acceleration and steering without driver input. It uses a laser scanner and camera to lock on to the car ahead and can guide cars through U-turns and S-turn slaloms at speeds up to 25 mph. Shin said the improved traffic jam assist is at least two years away. One concern: the cost of its laser scanner. But costs should drop rapidly as the technology spreads and volumes increase. Sensors account for the bulk of the safety systems' costs, and those prices are falling about 10 to 20 percent a year, Shin estimates. He said Mobis will have fully self-driving technology ready by 2020. But mass production is unlikely before 2030, he said, because regulators must sort out legal issues, including liability.